The full moon on the night of November 14, 2016 is not only the biggest, closest and brightest moon of this year, but will be the closest "supermoon" since January 26, 1948. 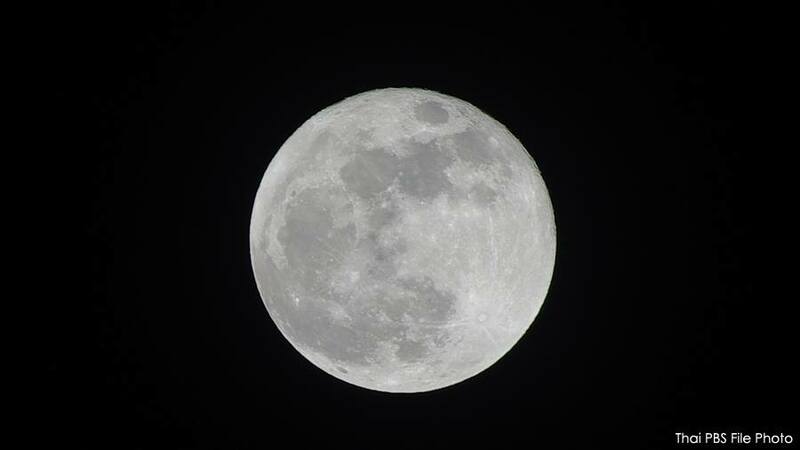 So don’t miss to watch for this full moon on the night of November 14 because it’ll be beautiful. But if you miss this rare phenomenon, then you have to wait until November 25, 2034 when the moon will come this close to Earth again. Dr Saran Poshyachinda, deputy director of the National Astronomical Research Institute of Thailand said the moon would be biggest and brightest in 68 years since 1948. He said NARIT would open its observation dome and join all its 160 observation decks at schools and communities in 61 provinces to lit candles under the moonlight to mourn the passing of the late King Bhumibol Adulyadej. He said three main observatories would be open for the public to watch the moon. They are at Central Festival Chiang Mai, Chalerm Phrakiat National Observatory in Nakhon Ratchasima, and Chalerm Phrakiat National Observatory in Chachoengsao. Telescopes will be installed at these places for people to spot the moon. He said the moon will be seen by eyes at the East at around 6.00 pm, and at the same time Mars, Venus and Saturn could also be visible. On the night of Loy Krathong day or on November 14, candles will be lit across the country at 19.09 hours to mourn the beloved King, he added.